If you are considering weight loss surgery, you are probably aware of the gastric sleeve procedure, a permanent surgical option for the treatment of obesity. The gastric sleeve, also known as a vertical sleeve gastrectomy, is currently the most popular bariatric (weight loss) procedure, with over half of patients electing this type of surgery for their treatment. The gastric sleeve procedure is, quite simply, a procedure to dramatically reduce the stomach’s ability to hold food. By reducing the size of the stomach to about 20 percent of its original size, the quantity of food that is able to be consumed in a meal is dramatically reduced. For most patients weight loss is a natural result of this significant decrease in the quantity of food able to be consumed. The gastric sleeve was initially performed as the first part of a more complex surgery called the duodenal switch (DS). 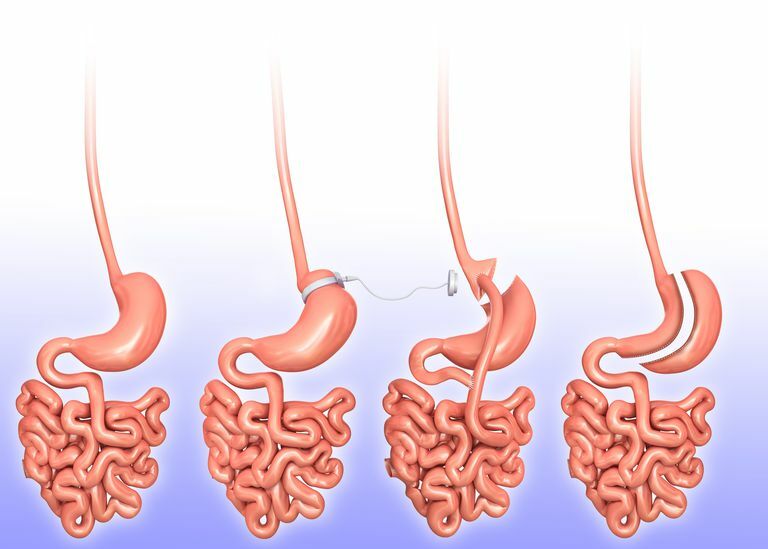 The duodenal switch was often done in two stages, with the gastric sleeve portion of the surgery being done first to decrease the size of the stomach. Then, weeks or months later, the rest of the surgery was performed, a procedure that decreased the amount of small intestine that is able to absorb food. Surgeons found that patients who had the first portion of the surgery completed lost weight, even when they didn’t have the second stage of surgery performed. They also noted that patients lost weight in the weeks or months between having the sleeve procedure performed and the second procedure that altered the small intestine completed. Noting these outcomes with the gastric sleeve surgery, surgeons began to research the procedure as a stand-alone surgical treatment for obesity. The sleeve was particularly of interest because the procedure is less risky than the intestine diverting portion of the surgery. The sleeve also has fewer complications than the lap-band and about the same long-term weight loss as the more invasive and high risk gastric bypass procedures. While ten year data is not yet available, the early results are excellent and indicate that the gastric sleeve is among the safest bariatric surgeries with the lowest long term complications when performed without the duodenal switch portion of the procedure. The gastric sleeve procedure is a permanent alteration in the size of the stomach with the intent of causing a dramatic change in an obese individual’s excess weight. Weight loss alone is not the only reason the procedure is done, as the side effects of weight loss may be the goal for some individuals. A dramatic decrease in unhealthy low density lipoprotein (LDL or bad cholesterol) along with a notable increase in high density lipoprotein (HDL or good cholesterol). The improvement in HDL is also due to the increase in exercise most gastric sleeve patients achieve after surgery. High blood pressure is often controlled or even completely cured by weight loss after bariatric surgery. The change in diet along with a decrease in excess weight often means that blood pressure medication is no longer necessary for keeping levels under control or at normal levels. Type 2 diabetes can be much easier to treat or even be cured with weight loss and lifestyle changes. Unlike type 1 diabetes, where the patient does not make insulin and needs insulin in the form of medication, type 2 diabetes can treated effectively by lifestyle changes in many cases. Even patients who are not cured after surgery typically find their disease far easier to control after weight loss. Sleep apnea, a condition that causes a person to stop breathing repeatedly during sleep, often is completely cured by weight loss. For patients who reach a normal body weight or lose enough weight to be considered overweight rather than obese, sleep apnea no longer requires treatment. As an added bonus, snoring often goes away entirely or is notably improved. Joint pain is frequently improved by reducing the load placed on the joints, which means weight loss is one of the best things that can be done for chronic joint aches and pains. While the gastric sleeve does reduce the amount of food an individual is able to eat in a meal, the gastric sleeve procedure works in additional ways that may not be as obvious as the reduction in stomach size. Most patients report a decrease in feelings of hunger due to the surgery, which can alter how ghrelin, the hunger hormone, is released. They no longer have the feelings of hunger or have those feelings less frequently or with less intensity after surgery. Additionally, most people feel full with far less food than they did prior to surgery. The typical gastric sleeve patient can expect to lose 50 to 80 percent of their excess weight after surgery. Excess weight is weight they are carrying that is over and above their calculated normal body weight. For example, if a patient’s normal body weight should be 150 pounds and they weigh 350 pounds, they have 200 pounds of excess body weight. They can expect to lose 50-80 percent of their excess body weight, which means an estimated loss of 100 to 160 pounds in the two years following surgery. The patient has significant control over the total weight loss after surgery. Those who start an exercise plan and stick with it are more likely to lose a higher percentage of excess weight, as are those who closely monitor their food intake through tracking, measuring, and weighing their food. If you are wondering if you qualify for gastric sleeve surgery, start by calculating your BMI. The BMI, or body mass index, is a measurement used to assess weight. The BMI is not a good tool in very muscular individuals, but is reliable for overweight individuals attempting to determine an appropriate goal weight or to determine the severity of obesity. A calculator is available here, or you can use this formula: multiply your weight in pounds by 703. Divide this number by your height in inches x your height in inches. If your BMI number is between 30 and 39.9, you may qualify for gastric sleeve surgery if you have an additional issue that is caused or worsened by obesity, such as high blood pressure, type 2 diabetes, sleep apnea or other conditions. If your BMI number is 29.9 or lower, you do not qualify for gastric sleeve surgery or other types of bariatric surgeries. Qualifying for surgery and being approved for surgery, or being a good candidate for a procedure are very different things. Qualifying is the first step for becoming a candidate for a bariatric procedure, but that does not mean surgery is appropriate. To determine if you are a good candidate for surgery you will need to talk to a bariatric surgeon. A great bariatric surgeon is a combination of gifted surgical skills and a desire to help people, along with empathy for what obese people experience. A surgeon also must provide patients with a healthcare team that goes beyond the surgery and delivers the tools patients need to thrive after surgery. Without great education from the healthcare team, you may not have a great outcome. Without skilled hands you may experience more complications than other patients, and some of those complications can be significant or even life-threatening. For these reasons and many others, it is important to choose your surgeon wisely. First, you will be looking for a surgeon who has performed not dozens or hundreds of gastric sleeve surgeries, but thousands. Next, you will be looking for an individual who has a strong record of successful patients both long term and short term with minimal complications such as infections after surgery. Certainly ask your friends and family members who they recommend, but be sure to check with the medical board in your state for any disciplinary action. Also, make sure the surgeon has been properly trained to perform weight loss surgery by completing a fellowship in bariatric surgery. The cost of the gastric sleeve procedure will vary widely with insurance coverage and the area of the country where surgery is being performed. The price of surgery can vary by more than $20,000 from one state to the next, and insurance policies vary widely on what is covered. Some insurance policies have a bariatric surgery exclusion, meaning that weight loss surgeries are never paid for by the policy, regardless of qualifications. You can determine if your policy covers these surgeries by calling the number on the back of your insurance card and asking about coverage. If insurance will pay for surgery, the average patient still pays several thousand dollars out of pocket. Without insurance the costs are often over $20,000. The typical patient typically finds that surgery pays for itself within a few years with the decrease in costs associated with healthcare and medications as their health improves. The typical patient can return to work two to three weeks after surgery if their job requires only mild activity. Most won’t be able to return to their full range of activities, particularly strenuous exercise, for four to six weeks following surgery. Once the recovery phase is completed, exercise is encouraged to maximize the long term success of the procedure and enhance weight loss. During the initial phases of recovery, food is limited in both quantity and type. Initially, very small amounts of fluid are the only food permitted, and over the next several weeks, regular food is reintroduced into the diet. The procedure leaves the connection to the intestine intact so dumping syndrome is not an issue like it can be with other surgeries, but simple carbohydrates are still avoided during this time. The gastric sleeve procedure is performed under general anesthesia and is done laparoscopically, using minimally invasive techniques. Once the patient is asleep, the surgery begins with at least three tiny incisions, including one hidden in the belly button. A light, camera and surgical instruments are inserted into these small incisions and the surgeon cuts away the majority of the stomach, leaving a portion of stomach shaped like a banana to connect the esophagus to the first part of the intestine called the duodenum. The incision line where the stomach was cut away is closed with staples and the suture line is checked to make sure that it is not leaking. The excess stomach tissue is removed through one of the incisions. The surgeon removes the instruments, closes the incisions with adhesive strips in most cases, and the patient is allowed to wake from anesthesia in the recovery area. All surgeries have risks, and the gastric sleeve is no exception. While the gastric sleeve is less risky than other bariatric surgeries, there are potential side effects and complications that can happen in the days or even years after surgery. In addition to the known risks of anesthesia, and the general risks of surgery, the gastric sleeve procedure can lead to additional side effects and complications. GERD, or gastroesophageal reflux disease, is an issue where stomach acid moves backward, splashing up into the esophagus, often causing heartburn. This typically decreases with weight loss. Vitamin and mineral deficiency is less likely to happen with gastric sleeve than other types of weight loss surgeries, but is still possible due to the decrease in food consumed. Most individuals require a multivitamin and may require prescription supplements. Gallstones are common with rapid weight loss, and are most likely to form in the months following surgery when the weight loss is happening the fastest. Sudden, severe, right upper abdomen pain after eating should be addressed with a healthcare provider and can indicate a gallbladder attack is occuring. Sagging skin is more likely with larger and faster weight loss, and can lead to additional surgeries to have excess skin removed permanently once the weight has stabilized. Weight loss surgery is in no way “the easy way” to lose weight, but it is a permanent tool to decrease the total amount of food that a person can consume. Even that tool can be abused, and with chronic overeating, the size of the stomach can stretch to accommodate much larger quantities of food than intended. Long term success will depend entirely on a willingness to create new habits, stop behaviors that led to obesity, and to maintain those changes long term. The most successful individuals create a system of accountability in their lives by working closely with friends, relatives and even professional healthcare providers to maintain good habits day to day. Patients will initially work with a dietician or nutritionist before and after their surgery, but some individuals will make a point of continuing a relationship with the nutrition staff for goal setting as well as maintenance of their weight loss. Among the recommended tools is daily tracking of food intake, such as an online diary or a food journal. Calorie counting may also be necessary for those who tend to overeat or eat mindlessly. For many, participating in a bariatric support group on a regular basis is an excellent way to stay on track and find people sharing the experience of bariatric surgery and life after surgery. Friends and family can also provide support, but cannot always empathize with the changes that are happening. Exercise is a key component of weight loss and maintenance, and becomes a major focus for many patients. To stay on track, some use personal trainers, others have a set schedule for exercise, and group classes can make exercise more of a social experience. Establishing fitness goals can be as important or more important than scale based weight loss goals. It is important to know that there are significant emotional issues that can accompany any type of weight loss procedure, and the following weight loss that occurs. For individuals who use eating as a coping mechanism, finding a new way to adapt and manage stress without food can be challenging. It is important to find healthy outlets for stress, as patients are at risk for turning to unhealthy ways of coping including drugs and alcohol. For other patients, the weight loss can trigger instability in relationships, and bariatric patients do have a higher rate of divorce in the years following surgery than the average person. Finding healthy ways to cope, such as exercise or making quality time for yourself, will be key to long term success. Open and clear communication with friends and family can also be useful, as can bariatric support groups. Some sources of stress can be anticipated, such as the expense of replacing clothes repeatedly due to weight loss, while others, such as realizing that they were discriminated against while obese, can be harder to deal with. Many patients report feeling resentful when others express a romantic interest that was not present when they were obese. These issues, and many others, can come up with the months and years following surgery. Using the services offered by your bariatric clinic such as group therapy, or even seeking out individual therapy may be useful when dealing with these issues. Weight gain is one of the things that bariatric patients dread the most. To work so hard, to have surgery, to do hours of exercise only to experience weight gain is a source of sadness and frustration. Some patients do gain weight, typically around the three to four year mark after surgery. Five years after surgery most patients have maintained a weight loss of 50 percent of their excess weight, which is far better than no weight loss at all, but this statistic is a source of fear for many. Slipping back into old habits, eating larger meals, not focusing on clean and healthful foods and, in particular, drinking calories are sources of weight gain. Weight gain is by no means permanent and can be conquered, even if it is the dreaded post-bariatric surgery gain that patients fear. For most bariatric patients the battle against obesity—or at least the ongoing effort to eat mindfully—continues long after the recovery from surgery. The decision to have gastric sleeve surgery is a serious one, and means a permanent change with a large portion of the stomach being removed. It is also a long term commitment to a healthy lifestyle, as surgery alone will not lead to long term good health. Surgery is a tool, but the true lasting weight loss happens when the patient chooses to adopt good habits and abandon bad ones for rest of their life. This can be challenging after surgery, but most patients will tell you that the true challenge is to remain at a healthy weight years after surgery and to maintain good habits.